The measurement and trending of abnormal ferrous wear debris in machinery lubrication oils is arguably the most significant indicator of machinery health and a key predictor of catastrophic machinery failure. There are several methods available to measure the ferrous content of lubrication oil. 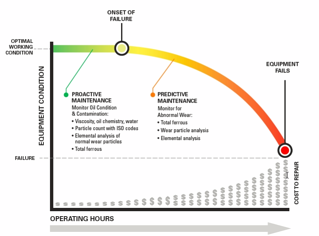 The P-F Curve (Potential- Failure Curve) illustrates how in-service oil analysis provides critical information on machine condition in both Proactive and Predictive Maintenance periods. In the Proactive period, oil condition and contamination monitoring help prevent the onset of the root causes of machine failure. In the Predictive period, monitoring the increasing severity of wear particles allows maintenance work orders to be executed for component replacement or repair before catastrophic failure. Magnetometers measure the change in inductance of a coil when ferrous material is introduced into the sample cell inside the coil set. The sensing element consists of three internal coils. The two outside field coils are oppositely wound and are driven by an alternating current source so that their respective magnetic fields are opposed and cancel at the center point between the field coils. The centrally positioned sense coil measures the disturbances in the magnetic fields caused by metallic particles in the sensor cell. Each coil is provided with a secondary winding which is wound on top of the primary winding, with close magnetic coupling. Thus the secondary winding will generate a voltage which is closely proportional to the back EMF of the primary winding. The net output of this pair is the difference between the back EMFs of the two coils. Because of the matching of the two coils, this output voltage should be zero if no ferrous material is present. A basic magnetometer provides a measurement of the elemental iron and provides a trendable total ferrous content. 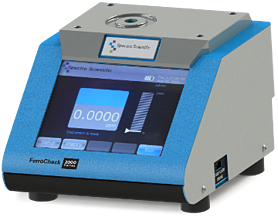 This total ferrous measurement is reported as either a dimensionless index such as ‘PQ” or a calibrated measurement of total ferrous in ppm (parts per million).